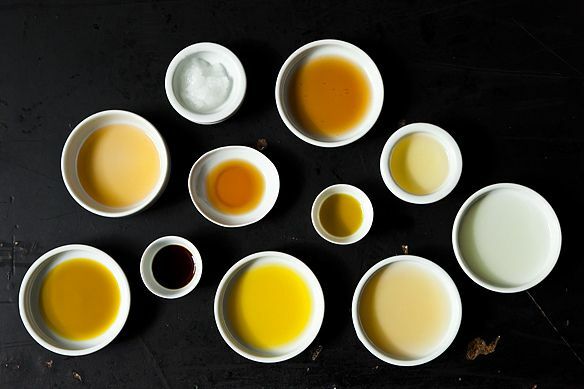 Today: When it comes to cooking and baking with oil, it's all about finding Mr. Right. Walking into the oil aisle is a sensory overload: all of those glistening bottles lined neatly in a row, their labels brimming with information. Once upon a time, the decision would have been made for you -- vegetable oil or nothing -- but these days, you have to process loads of information when picking out your purchase. Do you want refined or unrefined? Olive oil or canola? And boy, does the packaging on the pistachio oil look appealing or what? For frying, the cardinal rule of oil selection is to pick an oil with a smoke point -- the temperature at which the oil starts to smoke -- that is higher than the frying temperature the recipe calls for. Smoke points range from 200 to 400° F and also depend on how the oil was pressed, filtered, and refined. Because less processed oils have lower smoke points, refined oils are generally more suitable for high temperature cooking. Most foods are fried between 350 and 400° F. If you choose oils with a smoke point above 400° F, you're in the clear. Oil that starts to smoke will eventually catch on fire, but even oil that smokes and does not go up in flames will lose its flavor and its potential health benefits. You don't necessarily need a thermometer to monitor oil temperature. As oil heats, it will become fragrant and shimmery and will seem thinner than when you poured it from the bottle. When you notice all of these signs, the oil is approaching its smoke point and is hot enough to cook with. When you add the food, you'll automatically lower the oil's temperature and prevent it from reaching the smoke point. 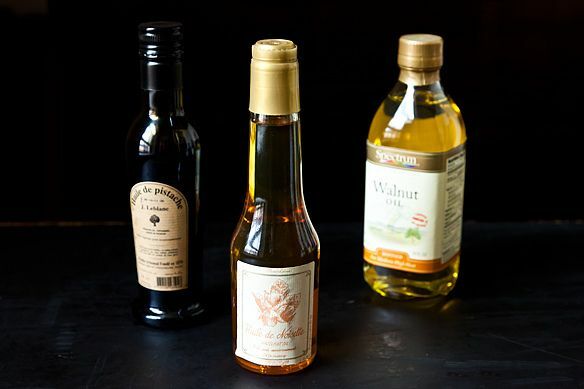 Nut oils -- like walnut, dark sesame, and roasted peanut oil or, if you're splurging, pistachio, hazelnut, pumpkin seed, and pecan oil -- are all best in cold dishes. Heat destroys their delicate, distinct flavors. Flavored or scented oils -- like wasabi, porcini, lemon, and truffle oil -- are generally expensive products where a little goes a long way. Olive oil has a low smoke point, making it unsuitable for deep-frying. Use it in dressings, garnishes, and for low-heat cooking. And don't write it off for baking either: granola and plum cake wouldn't be the same without it. Sesame oil comes in 2 varieties, light and dark. The light version has a mild nutty flavor and can be used for frying. Dark sesame oil, great for dressings, dipping sauces, and seasonings, has a stronger flavor and a low smoke point. Monitor it carefully if using it to cook. 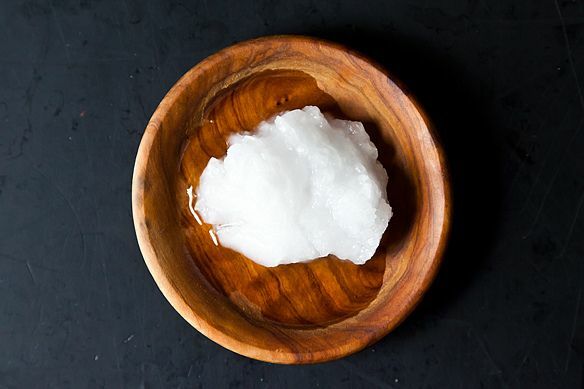 Coconut oil, which is solid at room temperature, can be substituted for butter to create vegan-friendly dishes. Butter may not be an oil, but we simply can't leave it out. Get the wonderful flavor of butter while side-stepping its low smoke point by mixing it with other oils, like olive oil, when cooking. Vegetable, canola, safflower, and sunflower oil are also often used in baked goods. Vegetable oil is an umbrella term for plant-based oils. It will likely contain soybean oil, but may also be made from cottonseed, sunflower, or safflower oil (or a combination). It is neutral-tasting, all-purpose, and great for baking and high-heat frying. Safflower oil is almost flavorless and has a high smoke point (520° F). 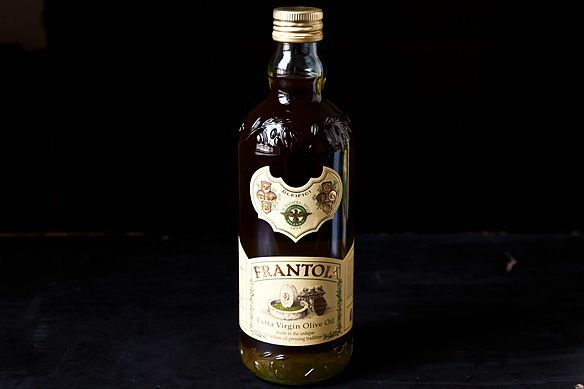 It can be used as a substitute for vegetable oil and, because it does not solidify when chilled, is also great for salad dressings. Canola oil, made from a natural hybrid derived from the rapeseed plant, is cheap, popular, and low in saturated fat. It will stay good on your shelf for about one year and its high smoke point -- between 425° F and 475° F -- makes it ideal for high heat applications. Rice bran oil is more expensive than other neutral oils, but has gained popularity for its health benefits and among cooks concerned about GMOs in other types of oil. Plus, in a Cook's Illustrated taste test, rice bran oil put canola oil to shame, especially at high temperatures. Corn oil, almost tasteless and able to withstand high temperatures without smoking, is useful for all-purpose cooking. Unrefined corn oil will have a more distinct corn flavor. Grapeseed oil is a a winemaking by-product that's neutral and versatile. Use it for sautéing, pan-frying, grilling, roasting. Peanut oil is different from its fellow nut oils in that it has a much milder flavor and much hihger smoking point. It's good for deep-frying, pan-frying, grilling, and roasting. Refined peanut oil is Cook's Illustrated number one choice for deep-frying. 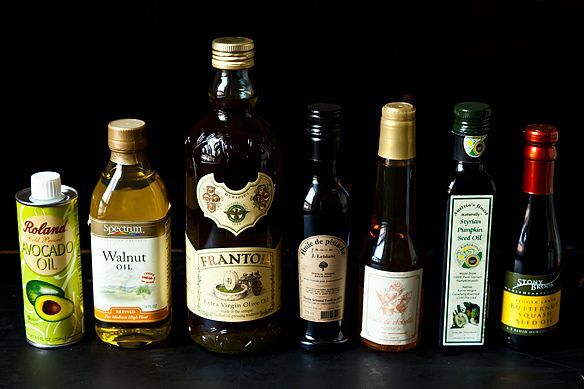 (Unrefined peanut oil, which comes in small, expensive bottles, is not suitable for frying and is much more flavorful). Avocado oil has many of the same health benefits of olive oil but has the advantage of a high smoke point (520° F), making it more suitable for high-temperature applications. Apricot kernel oil may be better known for its use in skin care and massage, but in How to Cook Everything Vegetarian, Mark Bittman calls it out as ideal for high-heat roasting and cooking. 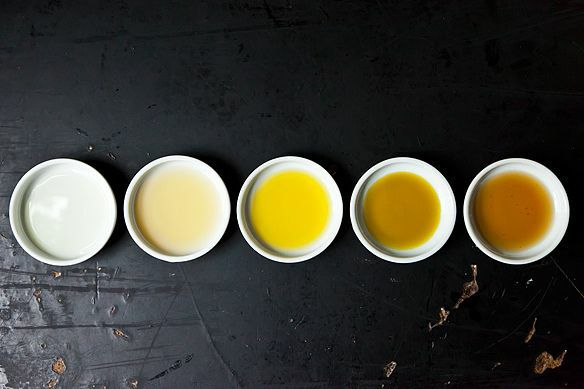 What are your favorite oils to use in the kitchen? Tell us in the comments below. Canola oil may last for a year from the time of pressing but you definitely should factor in time spent in transit and on grocery shelves. I've had it go rancid and "thick" sitting in my cabinet. I've also grown wary at purchasing items with canola as an ingredient because they can so easily go rancid while waiting to be purchased. Hello Duck Fat fries and roasted tators! ok, I occasionally fry (thawed) seafood, onion rings or french fries in an electric skillet with temperature control at 350deg. I find vegetable oil to be waaay too greasy even after draining it on a grocery store paper bag soaking all the way thru leaving a puddle. Peanut oil is rather expensive and lard is not an option. I've tried canola oil w/same results, help? Lots of great info on different oils. Answers many questions. When my husband was having gallbladder problems, I discovered grapeseed oil while reading about things that he could eat. I now use this oil in salad dressings as well as cakes or muffins that call for oil, also frying. There is no taste in the baked goods or dressings which vegetable or canola seems to come through. Palm oil is readily available in Asia and I use this for deep frying and stir-fry. Hi.. ! 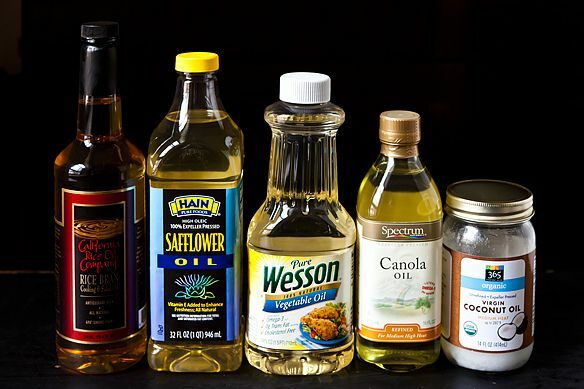 I read your blog and it seems like very informative blog about how to choose the right oil for cooking, dressing & drizzling, etc. If olive oil is bad for deep frying, why does the world love fried artichokes in the Jewish Quarter in Rome? Did you ever find out if it made a difference. I was planning on cooking that recipe this week. How can you leave out good old fashioned lard? For applications like frying chicken and pastry crusts, fluffy white lard is second to none. It is great to have all this info in one place. What about "light" olive oil. I love coconut oil! I use it in high-heat cooking, too -- it has a pretty high smoke point. I often use it to sautée kale or roast sweet potatoes. Mustard oil is generally not even mentioned in cooking applications in the US of A but it is a very traditional ingredient in Eastern Indian (West Bengal & Bangladesh)cuisine. It also happens to be used a lot in tradtional North Indian Achars, esp paired with cauliflower, turnips etc. Achars from South India tend to use cold pressed Sesame oil. How do you use mustard oil, Panfusine? Can it be used for frying or is it only appropriate in low-heat situations? Thank you! According to this handy, comprehensive table, the smoke point is almost 500 degrees. http://en.wikipedia.org/wiki/Smoke_point ;o) P.S. The links within the references at the bottom look interesting, too. Have no time to follow up right now, but this appears to be a reliable resource. Ghee is a popular choice for deep frying especially for Indian dessert and sweet confections. Clarifying butter increases the smoke point significantly, and makes it much more useful for sauteing and pan-frying. Great point! Ghee should definitely have a place on this list.